The Invictus Games, an international Paralympic style, multi-sports event, was created by Prince Harry of Wales in 2014 to host wounded, injured, or sick armed services personnel and their associated veterans in sporting event competitions such as wheelchair basketball, sitting volleyball and indoor rowing. Quoted as saying a good idea is worth copying, he took inspiration from the Warrior Games, a similar event held in the USA. Invictus is a surname for the Roman God Jupiter; the Latin meaning of Invictus is ”unconquered or “undefeated”. The games motto is “I am” – in charge of my own destiny”. The first Invictus Games was held in London, England in 2014. The second in Orlando, Florida in 2016. Canada plays host to 17 countries competing in the 3rd International Invictus Games, September 23 to 30, 2017 in Toronto, Ontario. Chiron correlates to the wounded healer archetype. Chiron also correlates to your most exceptional gifts, and your most extraordinary life path. 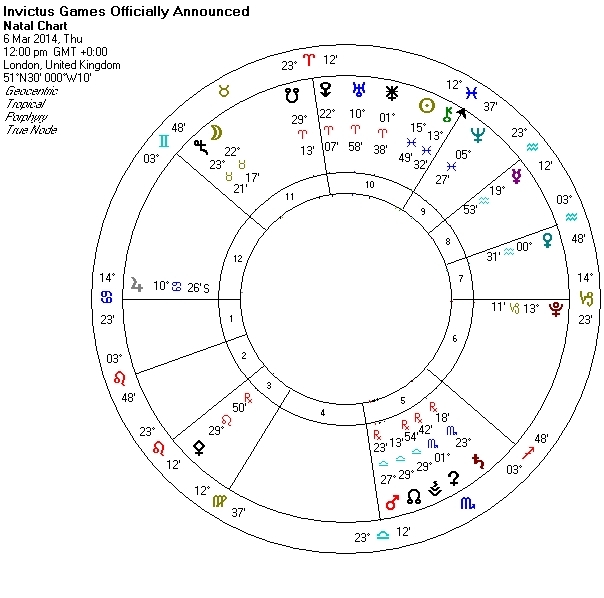 Note its elevated position (on the Midheaven) in the chart below (time estimate for noon). Setting the inception chart for noon, note Chiron is in Pisces in the 10th house, on the Midheaven. The 10th house marks the official announcement. Chiron conjunct the Sun in the 10th house speaks to increasing the profile of the wounded warrior, an attention to garner well deserved respect and honor for these special (sun) public servants (Pisces/10th house). Both Mars retrograde and Vesta retrograde applying to the north node speak to the intention to create a renewal of purpose and self worth (Libra) through physical (Mars) competition (Libra). The moon in Taurus in the 11th house (liberation; new goals) in the inception chart also speaks to finding new value and meaning. 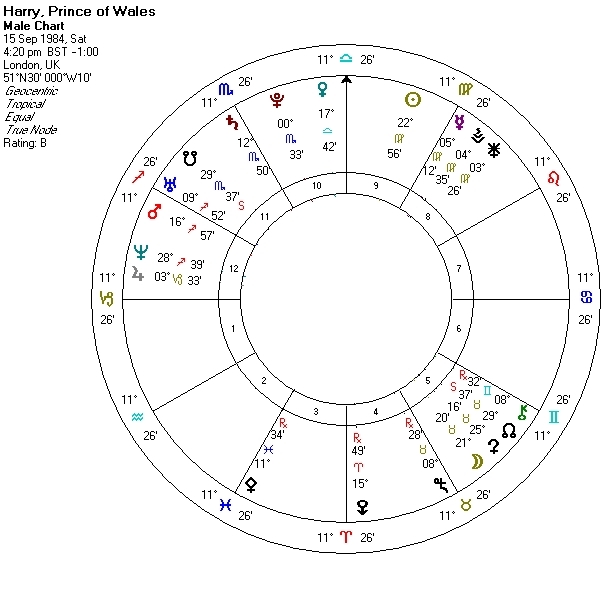 Note Harry’s natal moon/Ceres (advocacy; parent) are conjunct the inception chart moon. Affectionately dubbed “the spare” in reference to his brother (“the heir and the spare”), Prince Harry’s Chiron is retrograde in Gemini in the 5th house. Noting that his brother, Prince William, is a key karmic relationship and life determinant for the Prince regarding his succession status for the British throne, this Chiron placement is quite befitting. Gemini rules siblings. It also correlates to games. The fifth house correlates to creative self actualization and to one’s life purpose. Harry was born with Chiron in Gemini in the 5th house opposing Uranus in Sagittarius. 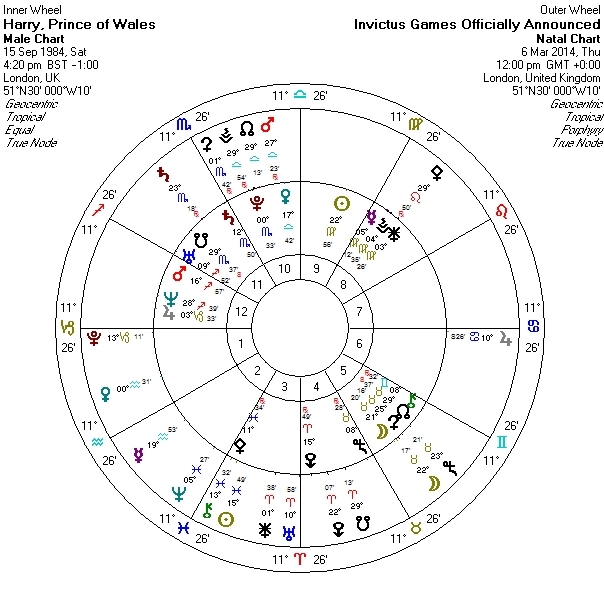 Of course, this Chiron/Uranus aspect readily displays the greatest wound of Harry’s life, that of the sudden and shocking (Uranus) of losing his beloved mother, Princess Diana – in car accident (Gemini) in Paris (Sagittarius: foreign country.) Chiron/Uranus also speaks to Princess Diana as a (think and act for yourself) role model (i.e. bringing greater attention to AIDs and working to break the stigma around it) and the legacy she left for both her sons to follow, that of her humanitarian advocacy of behalf of the marginalized and victimized. While the Royals have many public charities and projects that they spearhead, the Invicitus games are a new “invention” (Uranus). Poignantly, the creation (5th house) of the Invicitus Games which is aimed at helping others to rise up, appears to gift Prince Harry with an exceptional sense of purpose for his own life.